We are starting a CA non-profit corporation. What do we need to do? Soliciting donations via a website means that anyone in any state can donate to your charity. Simply having a “donate here” button on your website is viewed as a charitable solicitation in many states. Some states may not aggressively enforce the registration of this type of solicitation, but it is not safe to take that risk. 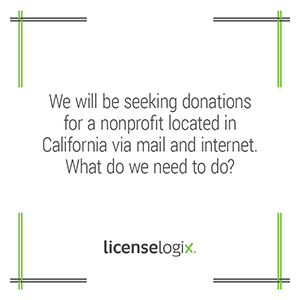 You will need to obtain charitable solicitation licenses in the 40 or so states that require them. You may also need to register your charity with the secretary of state in some of those states. We can help you file these initial registrations and navigate this tricky field. See Charitable Solicitation Registration for more information.